As many of you have no doubt noticed, the Firefly Ship Works (along with the QMx main website and other new franchise specific development blogs) have all moved to a shiny new design and server. Hopefully, this new server will be faster and the design more readable and just in general more fun to spend time on. The only downside to setting up on new server is we’ve had to reset the database. To protect your personal information, we don’t have access to password within our blogging platform. But that also means you’ll need to set-up a new account before you’ll be able to post comments again. Once you’ve done this (it only take a couple minutes, we promise), your blog account will let you post comments on any QMx website, including our new Star Trek, Battlestar, Stargate, Doctor Who, Dr. Horrible or Warehouse 13 blogs. UPDATED: Would You Put This Sticker on Your Car? UPDATE: Thanks for all your feedback; incredibly helpful, as always! 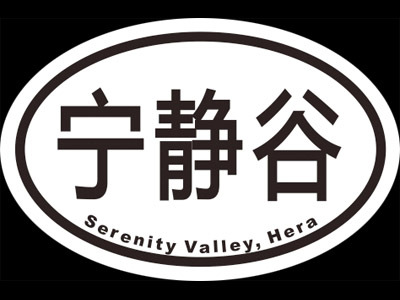 I’ve added another version of the sticker, this time with the single-character (simple) version of “Valley” and a heavier font overall. What’cha think?